We are excited to announce that Architects of Fear and Coma Club will be joining us and 1 other mystery band at The Haven in Winter Park on June, 18th! 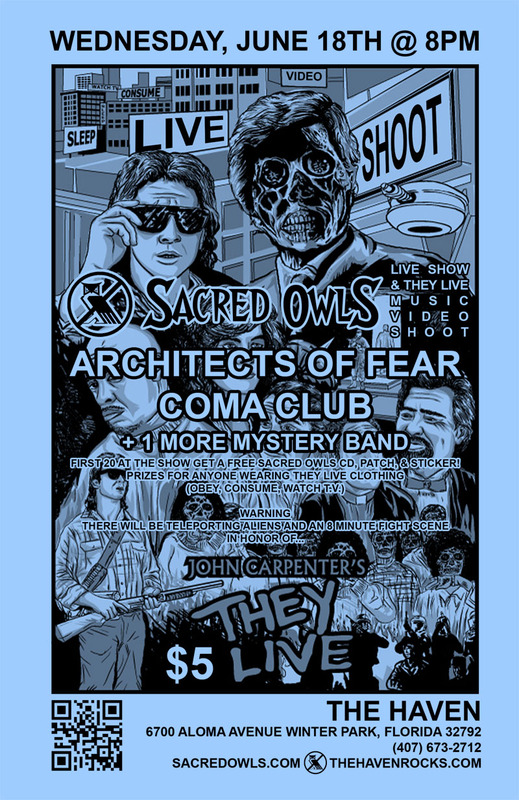 We have also decided to shoot a live music video for our song They Live at the show after meeting Roddy Piper and John Carpenter at Spooky Empire‘s Mayhem this weekend! It’s a short song (like 50 seconds) so the concept is simple. We put out glasses on and start playing, see aliens in the crowd (we got a mask for participants to wear), they teleport on stage and fight us. We crush them! If you wear any They Live clothing or have a mask we can use, you will get to be in the video and credited along with getting some free Sacred Owls stuff!